Every year, a week or two before Christmas, Grandma Royce would come over to help us make cookies. We’d make several batches, including the cinnamon cookies that she made when she was little. Once everything was done, we’d package up cookie assortments for our friends and family. Me and Grandma, 1974. Love those glasses! Grandma’s cinnamon cookie recipe was pretty basic–flour, butter, sugar, eggs, cinnamon. Nothing weird or wacky there! If you look at the ingredients we bake with today, though, you’ll see high fructose corn syrup, additives, or worse. Here’s a collection of homemade baking ingredients from top healthy living bloggers. 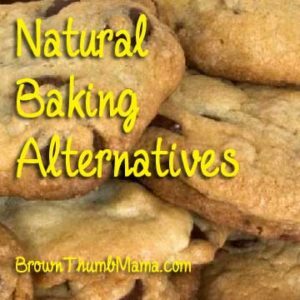 We invite you to use these natural alternatives in your holiday baking, and keep the chemicals out of your cookies. Enjoy! 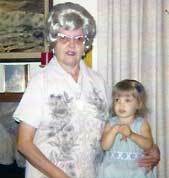 I have been feeling super nostalgic lately and that picture of you and grandma just makes me smile. Merry Christmas! !